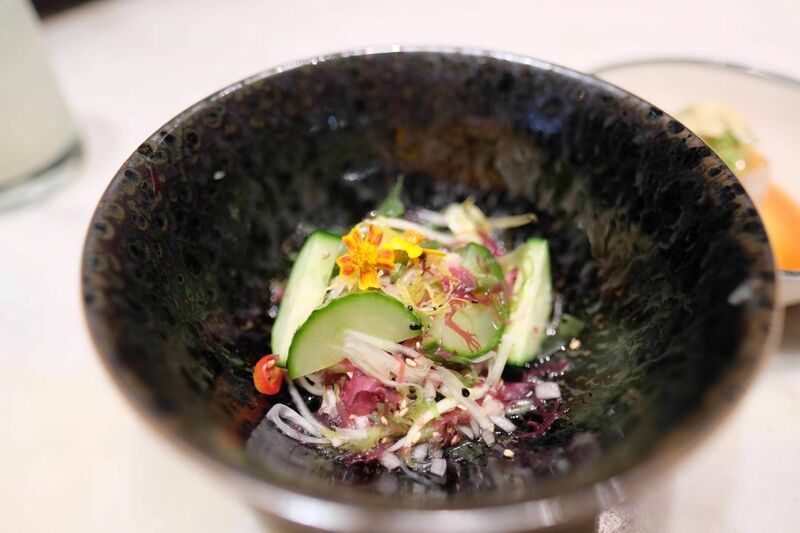 The Sunomono is just one of the beautiful plates available during Uchi's Sake Social Hour. At Five p.m. on a Friday evening, a line begins forming outside of Uchi Houston. 5 p.m. is, after all, their opening time. But it’s also the hour during which you can score a meal at Uchi for a fraction of its normal prices. 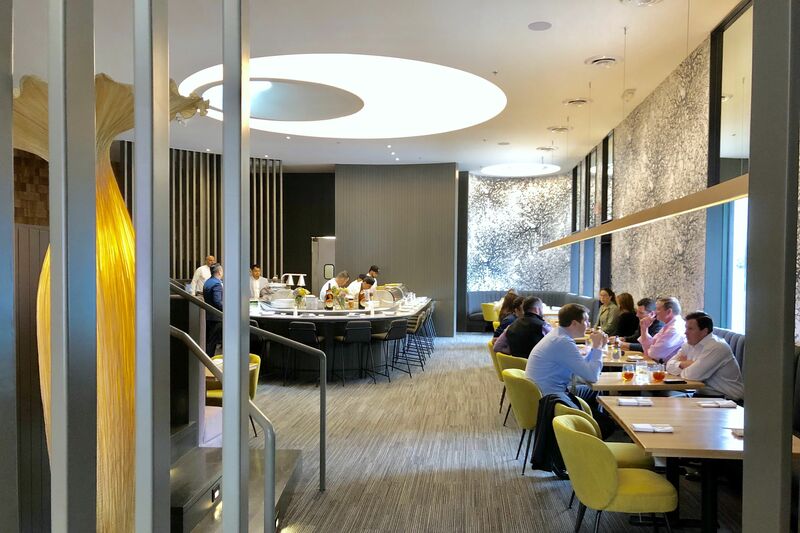 From 5 p.m. to 6:30 p.m. daily, Uchi hosts what they call their “Sake Social Hour,” fancy-speak for what most of us have come to know and love as happy hour. I suppose the fancy name is appropriate in this case, because Uchi’s Sake Social Hour is a cut above the rest. 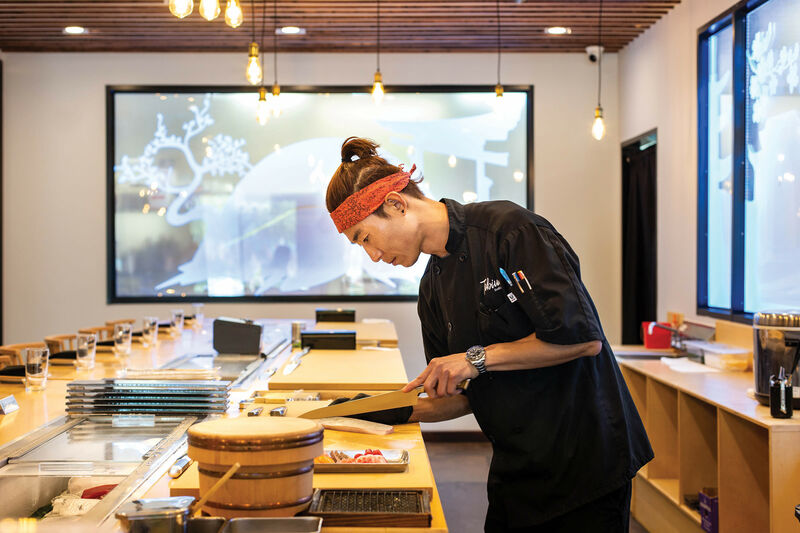 Sushi rolls — four choices are available — can be had for just $6 each. Sashimi, though smaller in size than Uchi’s regular menu places, come with the same pristine tasting fresh fish you would get on the regular menu. There are a slew of other items designed to stimulate your taste buds, all in the sub $10 range, making it all too easy to go to town. My Sake Social Hour turned into a Sake Social Order-the-entire-menu experiment about three courses in. We’d started with drinks. The Kara Kyuri, a sake-based cocktail made of sake, muddled cucumber, jalapeno and yuzu, is normally $11, but during the the Sake Social Hour, it’s only $6. It also happens to be my favorite cocktail there, so hallelujah (I made sure to get two drink orders in before 6:30 p.m.). I left the ordering in the trusted hands of Patrick Pham, Uchi’s lead sushi chef, who started our Sake Social Hour with a sashimi appetizer plate of Sake Crudo — salmon, white ponzu, tomato and myoga. Plated beautifully, with drops of bright green jalapeno oil, we received four slices of salmon topped with tomato, each piece achingly fresh and seasoned with a delicate citrus tang. Do not fear the walu walu at Uchi. From the kitchen, a small bowl of walu walu, which has been on the Sake Social Hour menu for as long as I can remember, came next. 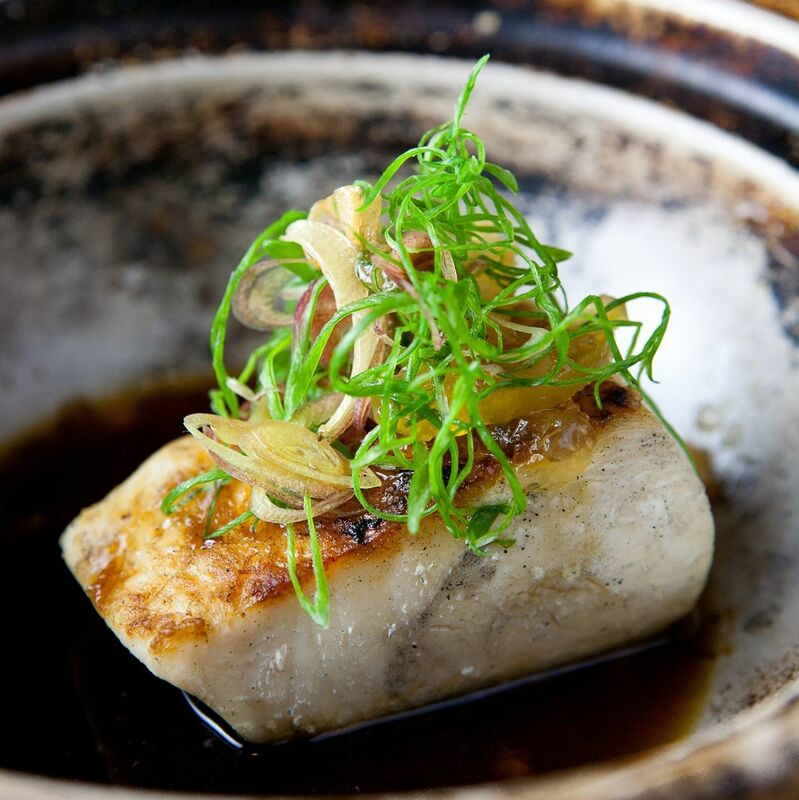 Walu walu, also known as escolar or butterfish, gets a bad rap because it can be hard to digest and result in, er, digestive problems. 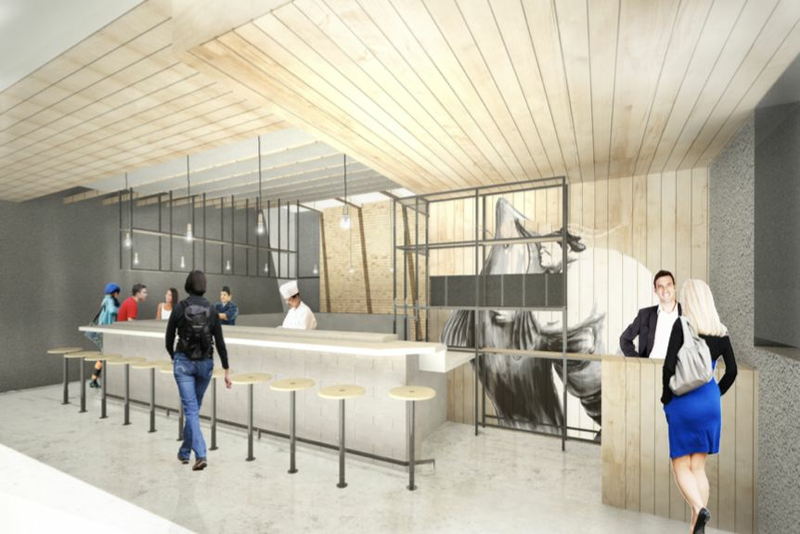 You don’t have to worry with Uchi’s walu walu, though. 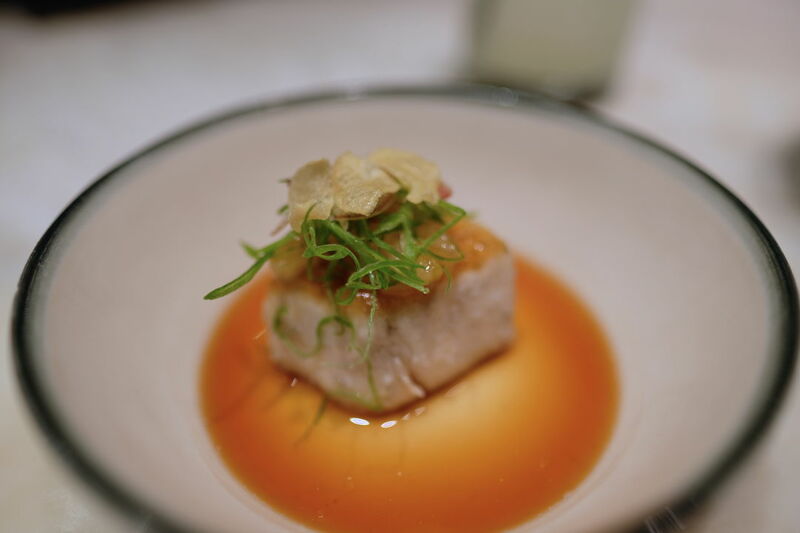 Served warm, in soupy bed of warm yuzupon, when you cut through the three-inch wedge of oak grilled escolar with your spoon, what you get is a juicy, buttery, thoroughly delightful mild fish that is just a pleasure. The quantity is small enough and the cooking of the fish ensures that you won’t have a problem (rest assured, I’ve never had a problem, and my system is very sensitive). Next up, we tried the new seaweed salad, or Sunomono, a composition of seaweed, cucumber, Thai chili and green papaya that was almost too pretty to eat. Tasting like a traditional Japanese sunomono with a Thai kick thanks to the papaya and chiles, it was lovely and refreshing. This is the point at which I told Patrick, “Let’s just do it all. The whole Sake Social Menu, okay?” He looked at me somewhat skeptically but nodded in assent, so here’s how it went. To follow the seaweed salad, we got into the maki, or the sushi rolls. I typically only order sushi rolls when I’m hungry or need a stomach filler, and that advice definitely applies here. While there are four rolls on the Sake Social menu, I definitely only recommend ordering judiciously, because the rice in the rolls will fill up your stomach quickly. Case in point, Uchi’s spicy crunchy tuna roll (the first of the rolls to hit the table), I ate with gusto. When the second roll came out, a negi hama futomaki (yellowtail, negi, cucumber, tamari), I ate with a little less enthusiasm. Ditto for the avo maki (avocado, fried shallot, yuzu kosho), even though it was my favorite of the four rolls. By the time the spicy sake maki (yuzu kosho, salmon, nikiri) came out, I had to force myself to try a piece. So word to the wise, choose one or two rolls, and save room in your stomach for other things. Consider order more than one machi cure. 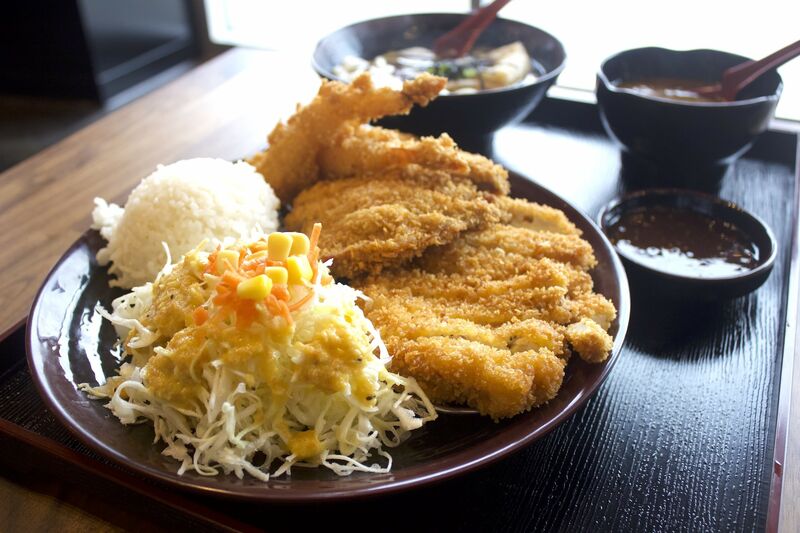 Something you might want to get two orders of, however, is the machi cure. 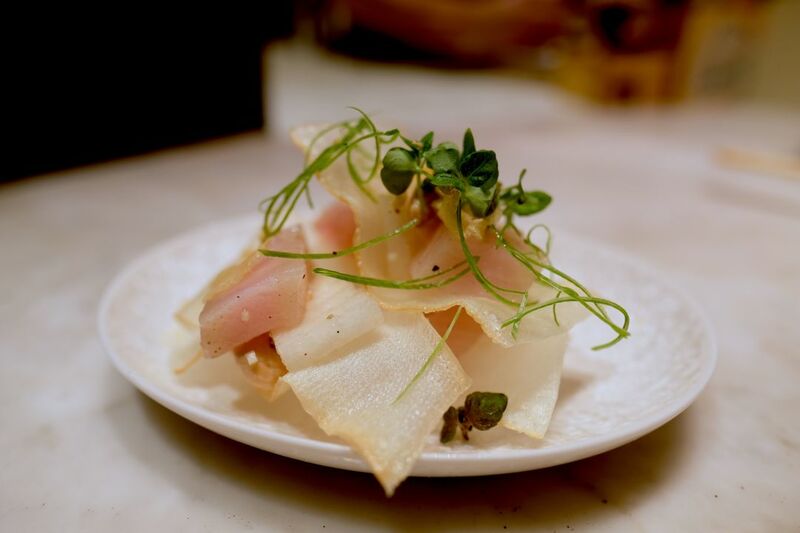 An Uchi signature dish which is also on the regular menu, the machi cure is likened to nachos because it’s composed of super thin yucca chips topped with smoked hamachi belly and marcona almonds. You get four bites on each Sake Social plate, enough to whet your appetite, not quite enough to satisfy. So, order another one if you’re feeling happy. I knew I had more coming, otherwise I would have. I really love the nasu nigiri. A simple vegetarian nigiri sushi made of grilled Japanese eggplant basted in with sweet miso, you get two pieces per order for just $3, and it always manages to leave an impression. This is another one that you might be tempted to double order, so if you like it, don’t be shy. That brings us to five new dishes that just debuted on the Sake Social menu this month. The first, a duck tom yum, is a crowd-pleaser. A savory soup dish that’s part French, Thai and Japanese, the server brings out a small bowl of shredded duck confit strips topped with small slices of pickled tomato. A hot, Thai-style tom yum sweet and sour broth is then poured on top, and the result is savory and hearty, if a little on the salty side for my taste (my girlfriend loved it). If you like fondue or melted cheese, you’ll love the fried yucca. The fried squares of yucca are crisp on the outside, and sort of gushy on the inside, and are served in bed of creamy miso mornay (a bechamel-type creamy sauce) for dipping. Then there’s the gyutan, or Wagyu beef tongue nigiri. If you’re all in for a lengua taco, this is an absolute must. Basted with a nikiri glaze, the plump texture of the tongue over sushi rice is a thing of beauty. Two pieces set you back just $7, and it’s well worth it. I didn’t get to try the short rib dish because they didn’t have it that day, but I was already at my upper limit at this point. That didn’t stop me from enjoying the pork belly rillette dish by new chef de cuisine Chris Davies, however. A small, tangerine-sized patty resembling a crispy hamburger, the whole thing is fried until crisp on the outside, but still sort of unctuous and juicy on the inside. Davies dressed it a sweet and sour tamarind curry and crisp green apple to cut through the richness of it. We finished off with a few pieces of nigiri, because if you’re going to visit Uchi, you can’t leave without trying the sushi. Patrick wowed us with his knife skills by scoring a gorgeous piece of kanpachi, followed by an even more gorgeous piece of blue fin o-toro from the Baja. And then we were done. Well, almost. The last bite of the night was the Sake Social dessert, a red bean cheesecake served in a cup like a sundae, with pineapple and Thai tea ice cream. So there you have it, my guide on how to navigate the Sake Social menu at Uchi. Do it like we did, and it’s like having your own 14-course tasting menu. Note that shots of sake (hot or cold) are also just $3 during the Sake Social Hour.